Irish and German grammar and vocabulary may readily be compared. The formation of nouns and adjectives, the declension of these and the use of prefixes, for example, are some of the points of interest. Nearly twenty shared grammatical structures are shown. They may be taken to indicate a certain linguistic heritage. German: ist meine Schwester zu sprechen? - may my sister be spoken to? Usage in Irish and German is only sketched below. Direct overlap is now limited. Palu, The Cat Goddess, 1976. [III] Reported speech, where the main clause verb is in the past. sie sagte, dass er gehen werde (future subj.) - she said that he would go (subj. wäre Ihnen das recht? would that be alright by you, then? The use of the subjunctive facilitates precision of thought. This finer aspect of language has been eroded to an extent in recent decades. In everyday parlance, the present subjunctive in Irish may be replaced, in subordinate clauses, by the future tense. The past subjunctive may be replaced by the conditional tense. In German, the past subjunctive can be replaced with the present. Both forms can be avoided. It is worthwhile to compare the circumstances when Gael and Teuton see doubt to arise and then use the subjunctive. (F i&ii) Impersonal/Reflective Verbs Impersonal verbs in both Irish and German can function as personal verbs. Pronouns can be used as an anticipatory object in the main clause. bhí cara liom ann - a friend of mine was there (was a friend with me in it). Both Irish and German can use the Infinitive form of the verb as a noun. The indefinite article is not used after the verb ‘to be’. That this poem actually begins erroneously with ‘Mise Raftaire an file’ has led many scholars to suggest that it was not, in fact, written by the great man himself. The article of the first noun is omitted before a second noun in the genitive case. This example shows that a particular observation may be misleading. The construction did not exist in Old Irish and so opens other questions. This Paper argues primarily on the number of similarities found. (N) Idiom shows, in a way, how we see the world. The examples above cover some common ground, which has been kept between Irish and German. Nonetheless, structures do evolve. For example, the Irish phrase “tá mé ag dul go dtí an chathair” is one way of saying: “I am going to the city”. This literally means: “I am (at) going until the city comes”. The Middle Irish ‘go dtí’ (‘until comes’) shows the introduction of a relativistic concept. Modern Irish speakers will not take cognizance of this underlying meaning. The sample list on the next page contains over 120 leximes, found at random. These were sometimes inherited by both Irish and German from Indo-European, were taken from Latin or simply went from one language to the other. In all, a much greater comparable vocabulary is indicated. It is pronunciation, not spelling, which is most important. Old spelling forms can be a useful guide to the origin of syllables. Apart from established processes of linguistic change (please see Annex), slang usage can play a part. A common example of slang is the French word ‘tête’ (f, head). It derives from the Latin testa (f, jug). Germanic tribes became known as teutonisch (from adj. tuath – left-handed, northern) and germanisch (from géar). The word Volk (n, people) may also have Celtic connections. With metathesis, the Gaelic word focal (m, word) resembles Volk. Das Volk, therefore, may have been distinctive tribes of ‘Speakers’. Perhaps they were noted by the main body of Celts to be using some new words. 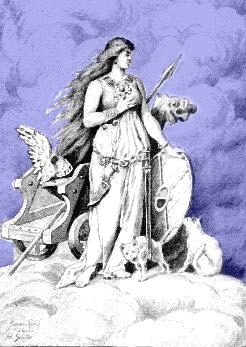 This recognition may date back to the differentiation between Celtic and Germanic peoples. There are words which have an intriguing characteristic. Whilst they carry the same root in Irish and German - they have opposite meanings. The Irish word freagra (m) means answer but the corresponding German word Frage (f) means question. Similarly the Irish verb gheibheann siad means they get but the German verb sie geben means they give. The Irish sníodh means to knit whilst the German schneiden means to cut. Brotherhood and a transparent system of determining one's honour (as reflected respectively by e.g. 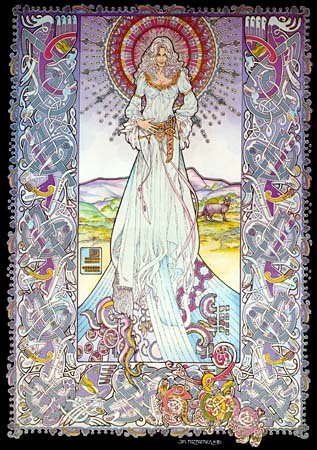 the relationship between kings and their people and the Brehon Laws) meant that, uniquely today, there is no du/Sie divide between the Gael. A plural sibh may be used only in addressing a Priest, on the understanding that he may be carrying the Sacred Host and, therefore, be not alone. As regards the right to respect, the meanest clansman stood on an equal footing with his chieftain. It is interesting to note the pride of the chieftains in their upbringing. (A) Names of Rivers take the definite article in both Irish and German: an Life - the Liffey, ‘einmal am Rhein’ - once by the Rhine. So can the days of the week and the seasons. In Scots Gaelic, all the months are used with the definite article. The 's' in 'ósna' and 'desna' is an Indo-European remnant, sometimes used. German has weak nouns which add -n or -en to the nominative singular to form other cases. Strong nouns add -s or -es to form the Genitive singular. Mixed nouns are strong in the singular (-s/-es) but weak in the plural (-n/en). Irish has weak plurals which have an 'i' before the final consonant of the nominative plural or add a terminal 'a'. All other plurals are strong. Class 1 nouns (no addition to plural):Kloster, Klöster (n, cloister), Apfel, Äpfel (m, apple). Class 2 nouns (add 'e' to plural): Fuss, Füsse (f, foot), Traum, Träume (m, dream). Class 3 nouns (add 'er' and modify): Amt, Ämter (n, office). First Declension: fear, fir (genitive singular and nominative plural) (m, man); gaiscíoch, gaiscígh (genitive singular and nominative plural) (m, hero). Second Declension: bruíon, bríne (genitive singular) (f, struggle). Third Declension: crios, creasa (genitive singular) (m, belt) - the reverse of the First Declension vowel change. The doers of an action add the suffix '-óir' to the noun in Irish, '-er' in German. German diminutive suffixes are -chen and -lein. A comparable Irish suffix is -ín. Irish: cailín (m, girl, little woman), poitín (m, an intoxicating drink, a potion) - these words begin the last syllable with an l sound and the German tch sound respectively. In Irish cailín is masculine and in German Mädchen (girl) is neuter because of these suffixes. Roots of different origin can be used in the declension of single noun. Adjectives may lose a vowel in the syllable being inflected. Etymology determines the sources and development of words. Philology is the study of comparative and historic linguistics. This paper does not speak from either discipline, as such, but reviews very briefly some observed linguistic connections between modern Irish and German. The study of words is called lexis. The subject is complex. Changes with languages occur all the time. The focus of investigation in the foregoing work is (i) syntax and roots which have not changed very much and (ii) root changes, which did not occur in both languages, because differentiation may have interfered with the process. Changes such as the consonant shift from ‘p’ to ‘v’ in German are not necessarily totally completed, even within the one language. There is the German ‘Bock’ and the Irish ‘poc’, for example. Having regard to the basic elements of language, useful comparisons maybe made by making reference to several paths of change. Some of these are sketched below. Linguistic groups establish their own body of leximes (items of vocabulary with a single referrant), though the physical tendency to use ‘m’ to begin the word for mother, for example, and the use of onomatopoeia affect this. Loanwords increase vocabulary too (‘asal’ in Irish and ‘ezel’ in German come from the Latin ‘asinus’). Sometimes a new label is introduced by using a word in a different class – conversion. For example, in Proto-Celtic the verb ‘to taste’ may have been used to provide a noun for ‘chin’. Thus today ‘schmecken’ survives in German and ‘smig’ in Irish. Semantic range identifies a set of ideas by a particular lexeme. ‘Fad’ is used to suggest length in Irish (‘fada’). In German it is used to mean something already long, eg thread (‘Faden’). Methatesis occurs when a morpheme it turned around as in the German ‘sechs’ (ks) and the Irish ‘seasca’ (sk). Metonymy occurs when the name of a part is used for the whole, as in the German ‘Dach’ and Irish ‘teach’. Other slippages of meaning can occur. Derivation (Wortbildung) is another way to introduce a label. By adding a morpheme (the smallest unit of vocabulary with meaning), new words can be made. Thus ‘Mench’ and ‘Urmensch’ (mankind and primitive man) in German and ‘scéal’ and ‘úrscéal’ (story and novel) in Irish. ‘Mench’ above is called a base and the prefix ur/úr was added. Suffixes also modify meaning as in ‘cailín’ in Irish and ‘Mädchen’ in German. Dental consonant exchange is common. Dentals are those consonant types included in the phrase ‘no dollars’. Thus the Irish ‘dúr’ and the German ‘Tor’. A word may lose a final part of a word (apocope) or an internal part (syncope). Again allow this to be happening in Proto-Celtic, so that today the final element of Burg (castle) in German is lost and the dental ’r’ is exchanged for ‘l’ to give Baile (town) in Irish. The final syllables of Indo-European words are inflected (to show case and tense). With lenition, the influence of neighbouring vowels may weaken consonants, as in the German ‘Fabel’ and the Irish ‘fabhal’. Aspiration of initial consonants may result in their being dropped altogether; in that way ‘p’ was lost from the Irish ‘athair’. With calques one language takes the principle of a foreign word but translates its constituents elements – rather than adopting and modifying the foreign word. Thus Irish has ‘teach spéire’ and German has ‘Wolkenkratzer’ for skyscraper. Sometimes a word may enter a language by different routes as in the Irish ‘ilstórach’ (skyscraper). A morpheme may be any discreet syllable (German ‘gut’, Irish ‘maith’) or an initial consonant cluster (as ‘bl’ in German ‘Bläser’ and Irish ‘bladar’). Consonant clusters may be divided using an epenthetic or helping vowel. This occurs especially in Irish eg with the insertion of a vowel between ‘n’ and ‘m’ in the word ‘aimn’. The comparable German syllabication has been noted. Short vowels tend to be interchangeable as in the German ‘Balg’ (shell, case, skin) and the Irish bolg (stomach). Such vowels are not written at all in Arabic. Communities bind together with a common language, from which common ideas and concepts emerge through syntax and idiom, as seen in phrase formation. Such communities are as large as the level of communication between groups within them. Thus, speech changes slowly as one goes a particular route from eg Paris to Lisbon but those in neither city will understand each other. This points to the existence of dialect continua. Linguistic change is unstoppable, as in the story of the Tower of Babel . The Story of the Irish Race by Seumas Mac Manus - Konecky & Konecky USA, p. 337.